The November 2018 election is coming up, and more women than ever are running for Congress. In our She’s Running series, HelloGiggles is highlighting some of the young, progressive women candidates who are reshaping the face of politics just by campaigning — and could have a hand in reshaping our future. Still need to register to vote? Do it here. When women fight, they win. Just ask the 169 women (so far) who crushed the competition in state and congressional primaries in 2018. And while the notion that women — and women of color in particular — can compete (and win!) still catches some members of the very white, very male political establishment by surprise, for the rest of us, it’s a no-brainer. But it’s their loss. Literally. Because according to EMILY’s List, more women than ever are running for political office in the United States. And with so-called “stunning” upsets led by strong, empowered, and progressive women like Alexandria Ocasio-Cortez, Stacey Abrams, and Deb Haaland, the message to the wealthy, white grandpas in races across the country is loud and clear: women came to win. Case in point: Sharice Davids. One of six Democrats vying for the party’s nomination in Kansas’ 3rd congressional district in the August 7th primary, Davids’ platform prioritizes issues like education, health care, gun safety, the environment, immigration, and equality for all. A first-time candidate for Congress, Davids joined the race back in February. Since then, she’s secured coveted endorsements from Moms Demand Action For Gun Sense in America, Victory Fund, and EMILY’s List. And like Ocasio-Cortez, Abrams, and Haaland, Davids is poised to make history. If she wins her congressional bid in November, Davids will be the first Indigenous woman ever elected to Congress. What’s more, she will be the first openly queer U.S. House representative from Kansas in the state’s history. Plus, Davids’ will fight for you. No, like, really fight for you. She’s a former Mixed Martial Arts fighter. So cue up “Eye of the Tiger” and get ready to punch the air with pride. 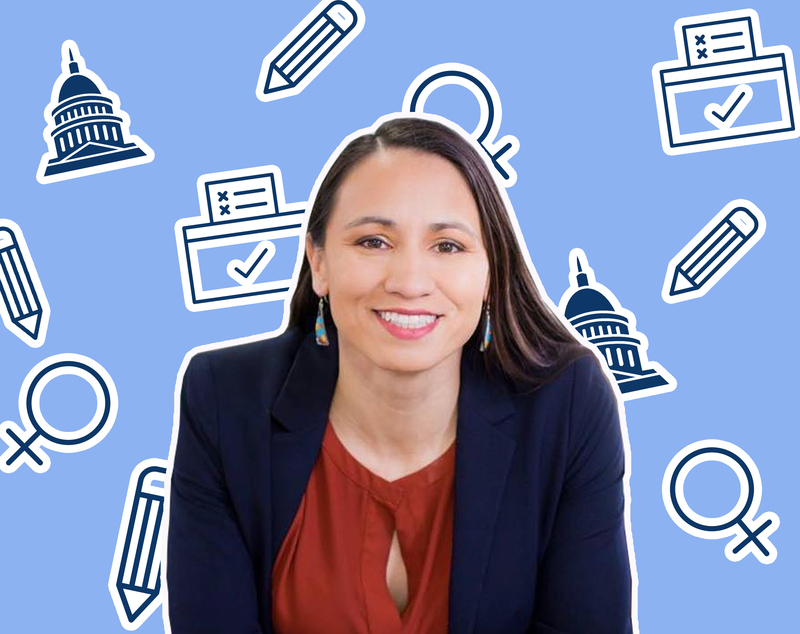 We asked Davids about what inspired her to enter the political ring, how her MMA training warmed her up for duking it out in public office, and what the title of first Native woman in Congress will mean to her should she win. HelloGiggles: You’re a Democrat running for the first time for Kansas’ 3rd congressional district. What inspired you to run for Congress? Sharice Davids: There are a couple of [reasons]. For this specific race, we have a representative [Republican incumbent Kevin Yoder] that I have been dissatisfied with for a very long time. He says one thing and does another which is, I think, part of the issue with our political decision makers now. And he came into office [under the pretense that] he was more of a moderate, and he is not. In a lot of Kansas, we just want things to be fair. We want things to be equitable, and I just don’t see that [as being important to] the incumbent. When I looked at the field of candidates in the democratic primary, [at the time] there were no women in the race, and I felt like we should have the option to vote for a woman. I think when you’re the one who’s standing there and asking the question, “Isn’t anybody going to do anything?”, it often means you should be putting up solutions. But big picture, we need more women in Congress. Representation matters. We recognize that truth now more than ever. Having a seat at the table, having a new voice in a discussion, can change the entire conversation. When you’re making policy that affects everyone, everyone should have a say in that discussion. HG: You grew up in a single-parent household. Your mom served in the U.S. Army. As a first-generation college student, you worked your way up from a Kansas community college to Cornell Law. Growing up, what values did you learn that you now take with you into this year’s congressional race? SD: It’s funny to say hard work, because when you grow up as an Army brat or part of a working-class family — regardless of whether you have one parent or two parents — you see a lot of people working hard, so I’m not sure that that is necessarily like any kind of differentiator. But certainly I learned the value of working hard. Also, I feel like just being raised by a strong woman has really affected my thoughts about who I am, what is my place, what is my role in all of this, and I think I was very fortunate to have my mom. She was realistic with me, but never discouraged me from trying things, so I had autonomy to both thrive and make mistakes. I think when you have that strong support early on, the lens you look through is one of opportunity. HG: You’re also a former Mixed Martial Arts fighter. In what ways do you think MMA training uniquely prepared you to battle it out in the political arena? SD: There’s a couple of things doing martial arts and training for martial arts fights help with. One is discipline. There are times when you have to wake up super early and go do quite a few things, and continue to work and push yourself, and you have to do it every single day. And that’s [true for] both training for a fight and for this. [Another similarity] is that you work so hard the entire time you’re training for a fight, but you don’t know what the outcome will be. All you can do is focus on making sure you’re doing the best you can every single day and that you’re pushing yourself and you’re growing. And that’s just like this. And it’s just as much [about] mindset. I think that sometimes when people don’t do things it’s because they’re scared of failure or scared of losing. But I’ve lost MMA fights. I know what’s it like to not succeed at every single thing I’ve ever done, so it doesn’t scare me. I have talked to people who have said [to me], “Oh, I’d love to run for office, but I just can’t imagine doing all that work and then losing,” and that’s not a fear of mine. So I definitely think that has prepared me to not just decide to run, but also just keep pushing forward. Just like a fight, the amount of work you put in in all the months leading up is what determines whether you win the fight or not. And all the work we’re doing now, that’s what will determine whether we win the primary. HG: What urgent issues concern you and your Kansas constituents most? SD: I’ve got kind of a top five list. Right now, we’re in the middle of trying to figure out how to make sure our public schools are properly funded, and while that’s primarily a state issue, having equitable, properly funded public education is a huge concern of a lot of the folks in the district. And because I am running for a federal office, there are a lot of discussions about Head Start, technology access, skyrocketing student loans, and college education costs. Gun safety is another huge issue here that people are really concerned about. Health care — health care access, insurance access — are big things, [too.] Then, immigration and environmental issues. Those are the top five issues consistently brought up by people as concerns. HG: Should you win your congressional bid, how do you hope to address issues like education, gun safety, and health care? SD: Children in America should have access to quality public education, no matter their zip code or ability. We need a strong partner at the federal level who will be a strong advocate and staunch defender of the public school system. [When it comes to] gun safety, we must recognize that America has a public health crisis in regards to gun violence. It is a public health issue and we must treat it as such. That means, in part, allowing the CDC to study the problem so we can find holistic solutions to addressing the problem. [Regarding] health care, everyone deserves easy access to affordable, quality health care. We must not only address coverage, but affordability, quality, access, and literacy. HG: Come November, you may be the first Indigenous woman ever elected to the U.S. House. Not to mention the first openly queer representative from Kansas. What does it mean to you to represent these communities in this race and potentially in Congress? SD: I definitely feel this immense sense of pride in just participating in this year’s election. Across the country, we’re seeing this movement of people whose voices have not been listened to for so long stepping into the political sphere and succeeding. And I know that at the end of my life when I look back, I’ll look back at this thing that I’m doing and think, “I’m glad that I was part of that.” I feel proud about being part of this. Because change happens so incrementally and I feel that this is the part that I get to play in history. I feel very honored to be part of the group of people that are doing this, and none of us are doing it alone. The fact that there are so many people working on this campaign, who have reached out to me and shared their stories with me, who are spending their time and energy and outside sweating, knocking on doors and making phone calls…it just makes me feel like [while] this campaign is about me in some ways (it’s got my name all over it), in more ways than that, it’s not about me at all. It’s about the way that all of us are standing up and saying we get to shape the narrative of this country as much as anybody else, and we want to do that and we’re going to do that. HG: What kind of lasting change do you hope to inspire with your candidacy and potential election to Congress? SD: There’s a whole lot of us [making change]. [I remember] when I decided to take the LSAT and apply to law school, I told a friend of mine, “The more of us that do it, the more of us that will do it.” [At the time,] I was talking about doing something after college, but I feel that’s what this is, too. The impact that all of us are running this year is that this is now the norm. [For example,] one of our team members has a daughter who is [around] 10 years old, and in the early days of the campaign, we were operating out of their house multiple days a week, and I [realized] her daughter is growing up seeing someone like me run for Congress. [To her,] it’s a totally normal thing. And when she’s 18 and she’s trying to figure out what she wants to do, she might think, “I want to run for Congress.” That’s what we’re changing. And it’s not just me. It’s all of us who are running this year.